The matchbox cover can be a canvas. They’re a fun little way to add a pop of color or art to any ordinary table or shelf. World Buyers knows that customers love these knick-knacks, so we stock a wide range of decorative and artistic matchboxes. You can find all styles, from portraits to Parisian-inspired to Day of the Dead to fantasy – and even independent artists! No matter what your customer is looking for, you’ll find complementary vintage matchbox art with World Buyers. Shop our wide selection below. ANN380 Vintage owl mini matchboxes. Six designs in a pack of 60. ANN386 Exclusive WB design featuring a vibrant collage of butterflies in every color! Each box has 50 matches with colored tips. 1 dozen boxes. Clearance price shown now 60% off! ANN344 MATCHES SHIP GROUND SHIPPING ONLY. NO INTERNATIONAL OTHER THAN CANADA. Two wishing mermaids hoping for a sailor! Exclusive WB design! Each box has 50 matches with colored tips. 4.41x2.36x.71" 1 dozen boxes. Matches ship to continental USA ONLY. No Canada or overseas shipments. Order in increment of 1. 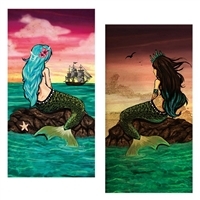 ANN357 Six designs in a pack of 60 mini mermaid matchboxes! World Buyers original designs! Mermaid sirens attracting their sailors.... Long matches, this box is 8.5x2.5x.75". Colored match tips. 1doz. 1 dozen matchboxes featuring vintage St.Nicholas artwork. ANN351 1 dozen matchboxes with colorful beachy dreamcatcher artwork. Colored match tips. ANN352 60 assorted mini square matchboxes featuring vintage holiday animal art. Colored match tips. 1 dozen cute hedgehog matchboxes. Colored match tips. ANN356 1 dozen unicorn matchboxes. Colored match tips. ANN358 1 dozen matchboxes with vintage sacred virgin artwork. Perfect matches for ZHC wish and prayer candle jars! 1 dozen sacred heart matchboxes. Perfect matches for our ZHC24WB prayer candle jar! ANN360 1 dozen winter wonderland matchboxes. Colored match tips. 1 dozen Wishing Star Angel matchboxes with wish prayer on backside! Perfect match for ZHC23WB Wishing Star Angel Candle Jar! 60 assorted square mini matchboxes. Vintage French farm artwork. 60 mini matchboxes. Spiritual artwork. Perfect little matches for our ZHC prayer and wish candle jars! 1 dozen long matchboxes. Lovely peacock and bird garden artwork! Exclusive WB matchbox with 50 black tip matches! Different image on each side of box. MATCHES SHIP GROUND ONLY. NO INTERNATIONAL SHIPPING. Exclusive WB matchbox with 50 pink tip matches! Different image on each side of box. Colors are deep rich tones. Image does not do them justice. The best and most unique selection of wholesale match boxes. Choose from endless themes from Day of the Dead, holiday, Buddha, animals, alternative themes and many more. MATCHES ONLY SHIP WITHIN CONTINENTAL USA. NO CANADIAN OR OVERSEAS SHIPMENTS.